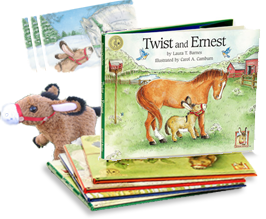 Have you read about me in the book Ernest and Elston? If you have, you know that I really like all of my friends at Barnesyard – and I want them to like me, too. I wanted them to like me so much that I even stopped crowing for a while. You’ll have to read my story to find out what happened. I like to spend my time with all of my barnyard friends, especially Ernest. 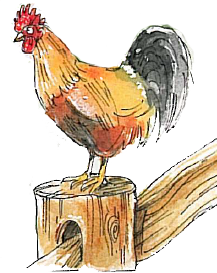 But sometimes I still act like I’m not a rooster – following Laura and her husband around like a dog would and wanting to be picked up and petted; I even like to be carried to bed at night. But now, I’m not trying to be someone else. I’m just having fun!